WASHINGTON – Arizona residents can expect to pay some of the lowest premiums in the nation under Obamacare, but the cost will vary widely within the state depending on where people live. A 40-year-old buying the second-lowest silver plan available on the federal marketplace could expect to pay about $178 if he or she lived in Maricopa, Pima or Santa Cruz counties – well below the national average of $280 a month. But the same plan would cost the same person as much as $300 a month before financial assistance if he or she lived in one of the state’s more rural counties, according to data provided by the Kaiser Family Foundation. As of last week, 180,113 Arizonans had signed up for insurance through the federal marketplace during the second year of enrollment under the Affordable Care Act, or Obamacare. Sunday is the deadline to enroll for 2015 coverage. Those who are uninsured come Monday will be fined $325 or 2 percent of their household income – whichever is higher. Most of those enrollments so far have come where most of the people live, with 68 percent coming from the Phoenix region and 15 percent from Tucson, according to data from the Department of Health and Human Services. Those are also the areas with some of the lowest monthly premiums, which experts attribute to competition among the many insurance companies and health providers in those markets. More providers give insurance companies an opportunity to negotiate better deals, said Allen Gjersvig, healthcare innovation director of the Arizona Alliance for Community Health Centers. “Pricing in a geographical area has much to do with the number of providers and the willingness of the providers to negotiate with the insurance companies,” Gjersvig said. Arizona also has 13 insurance providers that offer plans through the federal marketplace, twice the national average of six or seven per state. “Arizona is somewhat unique in that it has a lot of insurers participating in the market,” said Cynthia Cox, senior policy analyst at the Kaiser Family Foundation. But not all of those insurers offer plans in every county in the state. “There are a smaller number of insurance companies offering plans … a smaller number of plans, if you will, in the rural areas,” Gjersvig said. And things didn’t get any easier for people in rural Arizona looking to enroll for health care this year. 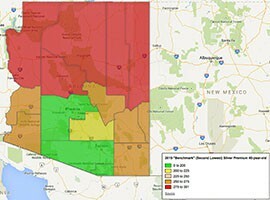 A Kaiser Family Foundation analysis found that while monthly costs in Maricopa and Santa Cruz counties dropped by 10 percent or more from 2014 to 2015, premiums in Mohave, Yavapai, Coconino, Navajo, Apache and Pinal counties grew more than 10 percent. Those premium rates do not account for income-based tax credits that health insurance clients can receive if they are enrolled through the federal marketplace. About 76 percent of those enrolled in Arizona qualify for tax credits. That is lower than the national average of 87 percent, but Cheryl O’Donnell of Enroll America said that could be driven by Arizona’s rates, which are already well below the rest of the country. “The fact that we have the lowest-cost plans in Phoenix – that’s still 8 out of 10 people that are still getting something to help cover their premiums,” said O’Donnell, the state director for Enroll America. As people make final decisions on an insurance plan in advance of Sunday’s deadline, Cox said it’s important for them to focus not only on the monthly cost but also the cost of co-pay and deductibles. Cox cautioned that consumers should choose a plan they know will fit their budget for the long haul, because after Sunday they will be stuck with that plan for the remainder of the year, absent a qualifying life event like a birth or marriage. “You don’t want to sign up for a plan with monthly payments that you can’t afford because if you get to a place in the middle of the year where you feel like you just can’t afford your insurance anymore, you don’t have any other option to switch plans or drop out of this coverage and sign up for something else,” Cox said. Monthly Obamacare premiums are low in Arizona, but vary widely across the state. Residents of counties in red could pay close to twice what those in green counties can expect to pay. Click on the map for details about each county.